¿ Como se te ocurre aprovechar un semáforo viejo? En Greenlight crean lámparas usando semáforos usados. Los faros verdes y rojos de los camiones son tirados a vertederos de basura . Ellos reclaman estos artefactos de vidrio para crear "Stoplights", su nueva línea de lámparas empotradas. Soy una joyera contemporánea que trabaja en el Museum of Brisbane Workspace . A veces tengo que destrozar las cosas en cumplimiento del deber , como ventanas o botellas. Otras veces, la naturaleza hace el destrozo por mí. 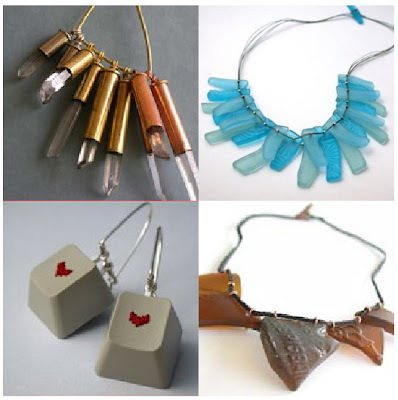 Drawn to the secret narratives and histories of recycled materials and found objects, Rebecca has often been compelled to incorporate them into her jewellery. I am a contemporary jeweller working at the Museum of Brisbane Workspace. I sometimes have to wreck things in the line of duty. Like windows and bottles. Other times, nature does the wrecking for me. Brothers Pablo and Blas Montoya in Spain formed an art and design collective in 2002 called Trashformaciones to take advantage of the family scrap iron recycling business. 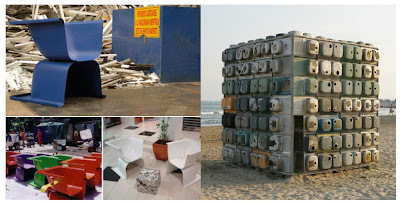 Using the wealth of discarded objects at hand, they began creating unusual furniture and art installations out of metal washbasins and bathtubs and exhibiting them outdoors and in museums and gallery spaces. ¿ Nos columpiamos en un neumático? 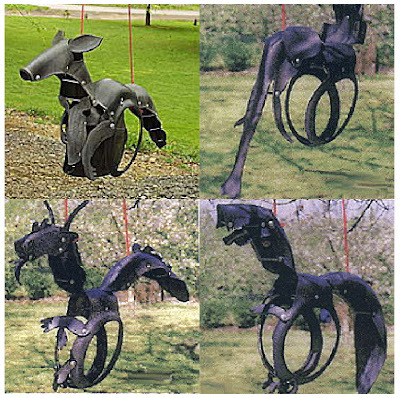 Remember the good old days when the world was at its best when you were under the maple tree swinging from an old tire?At Abundant Earth our hand-crafted Recycled Tire Swings are artfully shaped into a variety of different animals for added fun and excitement. All hardware on our Recycled Tire Swings is covered to ensure smooth surfaces and the tires are cleaned so black will not rub off on clothes and hands. 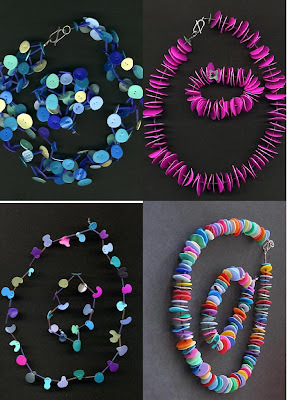 Rebecca Crawford hace sus collares de botellas de plástico que encuentra en las playas. Cada forma es cortada por separado a mano asi que no hay dos collares iguales pues los colores varían. Los collares de "Nurdle" están hechos de trozos de plástico diminutos , que son transportados por mar hasta nuestras playas en Cornwall . Causan el daño enorme a los animales al ser confundidos con huevos de pescado y comidos. I make these from plastic bottles I find on the beaches . Each shape is cut out individually by hand so no two necklaces turn out the same, so colours will vary! almost every colour combination is possible. The 'Nurdle' necklaces are made from tiny plastic grains, they are transported by sea and are easily spilled - Our beaches in cornwall are full of them. They cause huge damage to our sea life as they are mistaken for fish eggs and eaten. ¿ Que hacer con los envases de los huevos? Lola me lanzó el reto de que hacer con los envases de los huevos y ahí va lo que he encontrado. 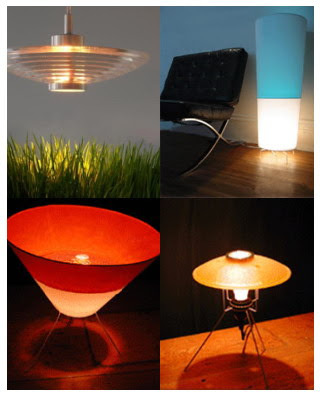 Arriba , una curiosa lampara que se llama "Cholesterol Lamp". Un costurero de Marie Claire Idees. Los adornos de mi arbol de Navidad. Un curioso pingüino, unos tulipanes,un mostruo y un semillero. Y por lo que contais son estupendos para insonorizar. Lola tell me what to do with the packages of the eggs . A curious lamp that is called "Cholesterol Lamp". The adornments of my Christmas tree. A curious penguin, a few tulips, a monster and a seedbed. I continue waiting more suggestions. Para celebrar las 10.000 visitas se me ocurre un reto. Decidme un objeto que usualmente se tira a la basura y yo veré si encuentro a alguien que lo recicla o lo reutiliza. No me lo pongais muy dificil. 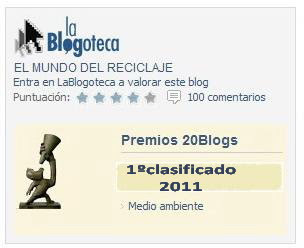 To celebrate 10.000 visits you can choose an object that usually throws itself to the garbage and I will see if I find someone who recycles it or re-uses it. Not me very difficult please. El sofá RAJAM es un diseño de Eduardo Simoëns, estudiante en diseño. Se trata de una experimentación formal entre la flexibilidad de un tejido de embalaje plegado (polietileno de baja densidad) y una estructura tubular en metal que lo sostiene. Este montaje crea una forma de sofá confortable y flexible utilizando estos materiales, obtenemos un objeto totalmente reciclable, muy ligero y poco costoso , hecho raro para una pieza única. 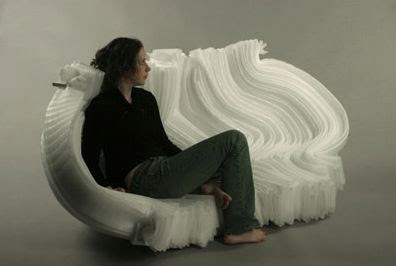 The sofa RAJAM is Eduardo Simoëns design , student in design. It is about a formal experimentation between the flexibility of packaging material (Polyetylene low density) and a tubular structure in metal that sustains it. This assembly believes a form of comfortable and flexible sofa using these materials, we obtain a completely recyclable, very slight and not very expensive object. Since I have this blog before throwing something to the garbage I look it. I have realized a collage with some objects that we throw usually .How you see in one of the photos not all the rings they are equal. To seeing if someone succeeds wherefrom I have extracted the balls. Desde el año 2004 Stuart Haygarth viene trabajando con materiales de desecho y se dedica a recoger objetos para luego agruparlos de acuerdo a sus características. Su idea es la de transformar el significado de estos objetos convirtiéndolos en algo hermoso y funcional. 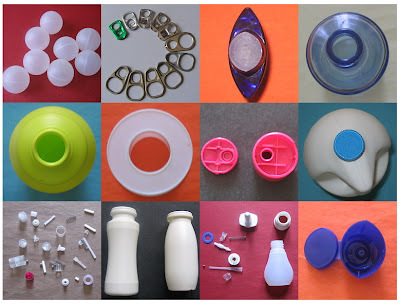 Stuart Haygarth has been collecting material over a 2 year period and the work is still in progress. The material collected is sorted and categorized and several individual pieces of work are produced.